Star SU tool coatings are done in cooperation with Oerlikon Balzers. Oerlikon Balzers Tool Coatings utilize the highest degree of technology in all aspects of the coating process to insure that the maximum quality coatings are deposited on the customer's tools. The cleaning lines, vacuum chambers and inspection equipment are state-of-the-art and unsurpassed by any other provider of PVD coatings. Our own technical expertise and the expertise of Oerlikon Balzers allows Star SU to provide customer support in helping determine the best coating for any application. All Balzers thin film coatings are available to customers through the U.S., Canada, and Mexico. Coating types are tailored for different operating conditions. Star Cutter’s machine tool and cutting tool experts will provide professional tool coating and recoating services for your cutting tools. 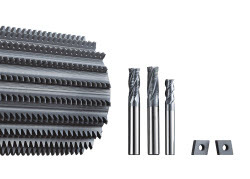 Contact us today, or you can learn more about our machine tools and cutting tools.